1879-1890s autograph album of May Ola Johnson of Ivesdale, Illinois. 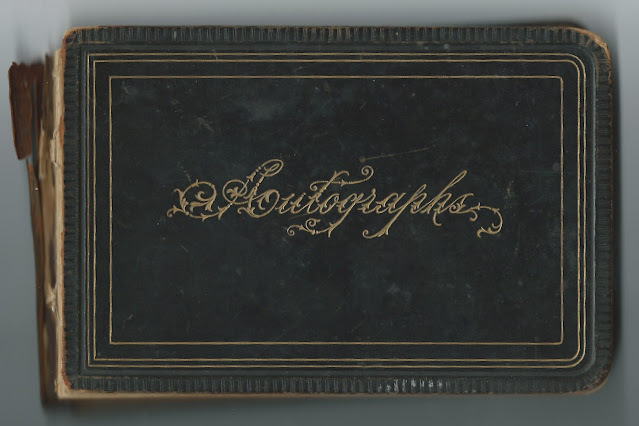 See another post that features May's 1880s autograph album. The album was given to May by Doc Redford, presumably the O. W. Redford who inscribed the first page in the album, on December 25, 1879. 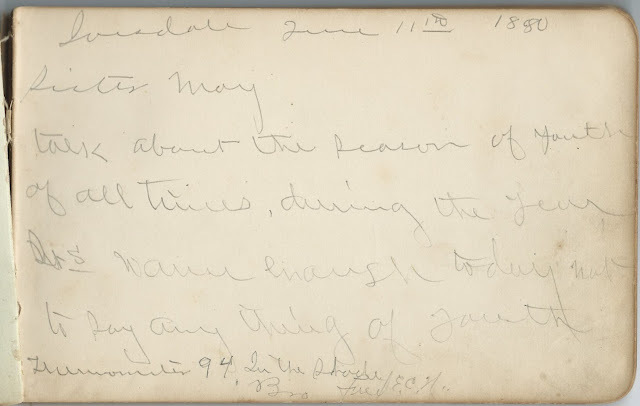 The album measures approximately 7-1/2" x 4-3/4" and contains the sentiments of over 30 of May's relatives and friends, including her future husband Andrew Stratton and son Charley Stratton [images of those pages farther below]. An alphabetical surname list and an alphabetical list of the signers, together with any personal information they offered, appear at the end of this post. A few also inscribed pages in May's other album. May Ola Johnson was born March 24, 1862 at Ivesdale, Illinois, the daughter of William Henry Johnson and second wife Catherine Louisa Rosenplanther, who were born in Massachusetts and Germany, respectively. 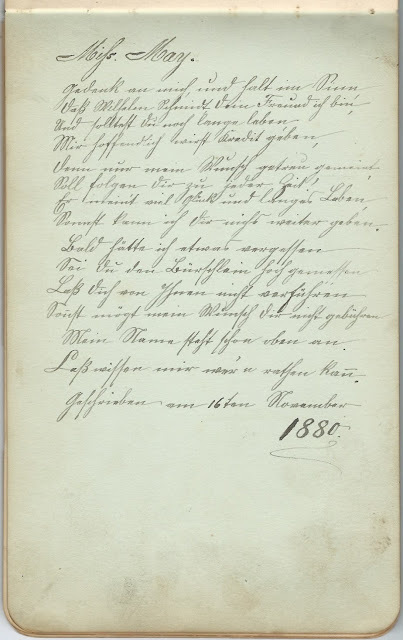 It's tempting to think that a page written in German in the album might have been inscribed by Catherine Louisa or one of her relatives. Hopefully a reader will provide a translation. May's father, William Henry Johnson, the son of Enoch and Lydia (Purinton) Johnson, was first married to Catherine Leagle, who died in 1849 after having at least three children. 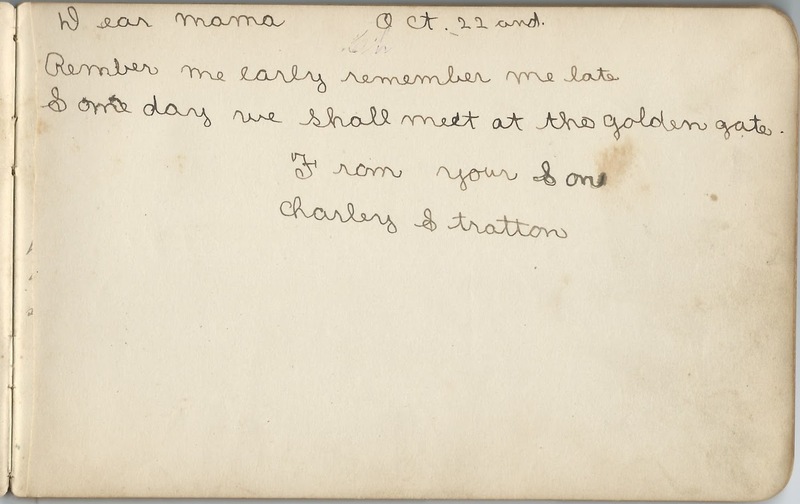 I believe it was one of these children, Frederick, who inscribed two pages in his half-sister's album. Another half-sibling, Adeline (Johnson) Gillman and her daughter Minnie Gillman, inscribed pages in the other album, which you can see there. About 1891, May Ola Johnson married Andrew Stratton, son of Thomas and Margaret (Pringle) Stratton. Andrew was born at Hamilton, Ontario, on June 30, 1855. 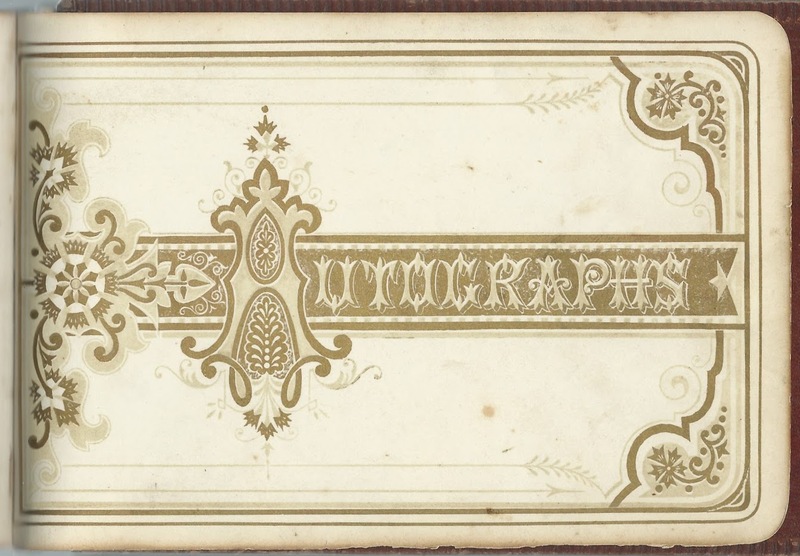 He inscribed several pages in the other album and a page in this album in August 1881. 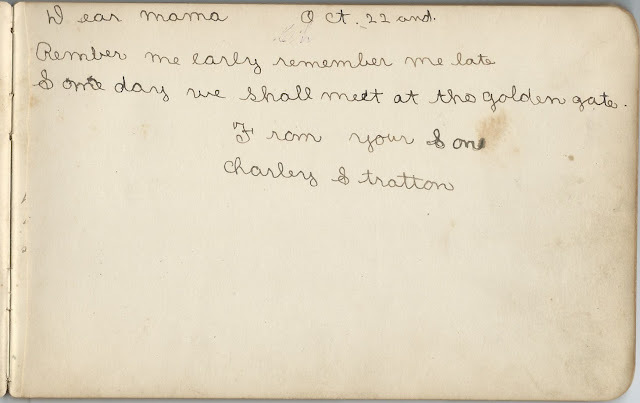 Their son Charles Stratton inscribed what appears to be the latest page in the album. 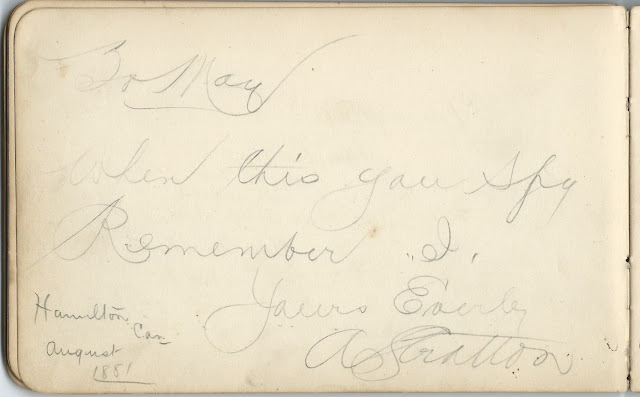 He didn't write the year, unfortunately, but I assume it was sometime in the mid to late 1890s, as he was born about June 1891. Sadly, Charley died in 1908. Andrew and May had another child, daughter Louise M. Stratton, who lived a long life. Andrew died in 1927 and May in 1953.
? ? Benefiel, signed on December 13, 1880. First two initials might be N or A, both or mixed. J. W. Donovan, signed at Ivesdale, Illinois, on "7/9-1880"
Edy; presumably Edy J. Heyman, who signed another page. Edy J. Heyman of Chicago, Illinois. ?, possibly Fred, signed on January 2, 1880. Possibly May's older half-brother Frederick Johnson, who inscribed another page. 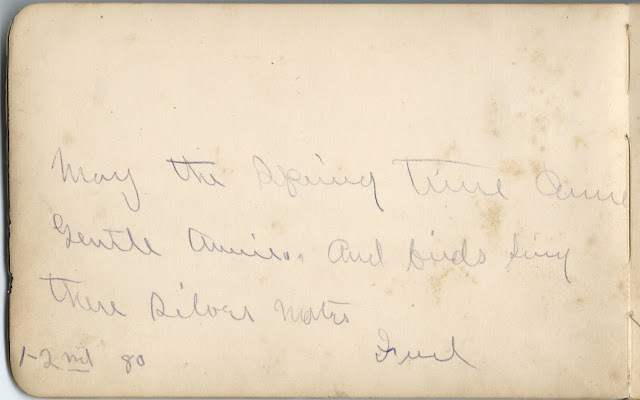 Fred, E. C. N [or H.]., signed at Ivesdale, Illinois, on June 11, 1880; May's older half-brother Frederick Johnson. 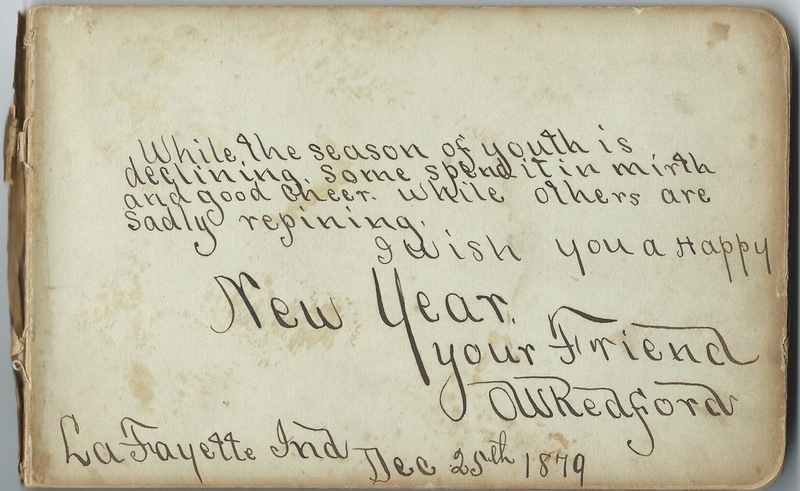 O. W. Redford, signed at Lafayette, Indiana, on December 25, 1879. 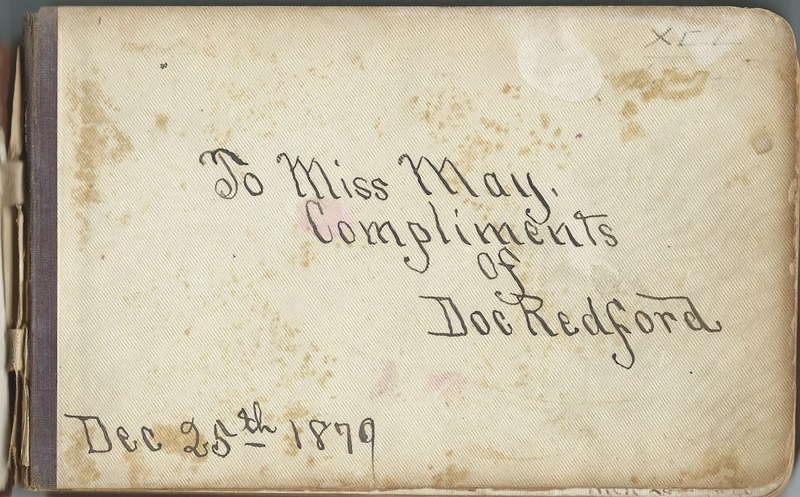 "Doc" Redford presented the album to May on December 25, 1879.